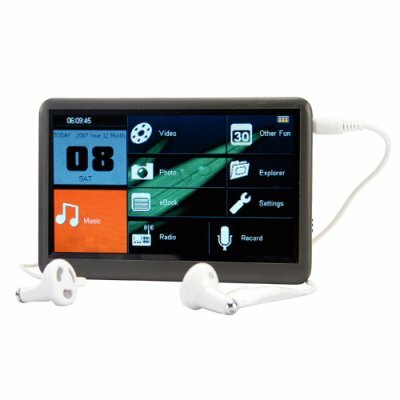 Successfully Added The Bomb - 8GB MP6 Player with 4.3 Inch Touchscreen LCD to your Shopping Cart. What is The Bomb? It's a complete digital media player that handles MP3 + MP4 + MP5 + MP6 functions all in one unit. With features including native playback of 20 popular multimedia file formats, a 4.3 inch touchscreen display (16:9 widescreen), rich featured e-book reader, 8GB's of internal memory, support for 18 languages, and even a TV OUT function, The Bomb is a digital media player that makes an explosive statement however you choose to use it! That's right, this MP6 player does all this and still even has a few extra tricks up its sleeve! The Bomb is a PMP that does more than the iPod, Zune, and all of those other "name brand" players put together! This portable media player (PMP) includes an easy to use interface for easily accessing your collection of music, videos, pictures, e-books, and plays all of today's most popular video and music file formats. So if you want an MP4 Player perfect for enjoying all your digital media when you are on the go, then The Bomb is what you need! Available in our warehouse right now, place your order today and we will ship it out tomorrow! Straight from the factory to you, only at chinavasion.com! No proprietary software needed. Just load it up with your favorite files like you would any USB flash drive or SD card. Rugged metal case is tougher and much more durable than any similar sized MP4 player on the market today! THE BOMB is called an MP6 player, what is that? Is it like an MP5 player? There are no such things as MP5 files, so no product can be an MP5 player. However, this product has all the features you see in advertised MP5 + MP4 + MP3 players, and much more, hence it is called an MP6 player. Actually, The Bomb is so good we should be calling it an MP10 player! How come certain settings do not register when I change them? Follow these steps: 1) Change whatever settings you want. 2) Return to the main menu. 3) Hold the on button for 5 seconds and then release (the screen will turn off). 4) Hold the on button for 10 seconds and then release (the unit will turn back on). 5) Settings are saved. The bomb arrived in 5 days. Fast delivery from China to 'Italy The player is really good as insertion Act any video format and audio I have yet to test the e-book and free TV, but up to now is a really good question. Alfredo Schiatti from Lucca Italy. on 2011-08-28 01:11:59 good little mp player . very good for the money all my avi vids play on it, and music went straight on to, delivery was a week to england was packed ok will be getting more of these to resell and hopefully buying lots moor things from this site .